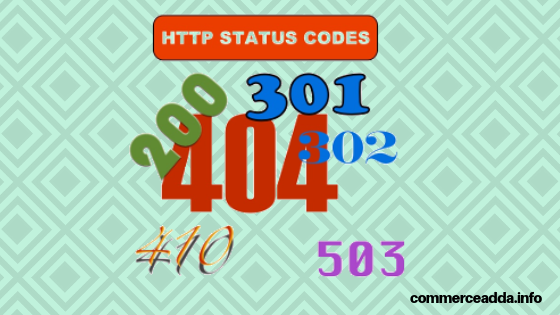 HTTP status codes are the responses that servers offer for individual's user request. When we want to check out some web site, our browser sent a request to web server, the web server sends a feedback to the internet browser's request with 3 digit codes referred to as "HTTP Status Codes". Status codes are the communication/conversation codes in between your browser and a web server. These HTTP Status Codes specify the result of your request whether the condition is Okay, pending, or something is wrong. Understanding the HTTP status codes in SEO is the finest method, as they are handy to detect website error as quickly as possible. Here, We're trying to allow you know about significant HTTP status codes or errors which are highly suggested by webmasters to be resolved. Understanding these codes will help you to optimize or rank your website in search engines. Http Status codes are classified into 5 different classes. That I'm going to list here, after that we will discuss on most important Status codes that every blogger should know. The informational response indicates that the request has been received and understood by the web server. It alerts the user to wait for a final response. Status codes of this class indicate the request generated by the client was received, understood and accepted, And the server gave the browser the expected response. This series indicates that you must take additional action to complete the browser request. Many of these status codes (like 301. 307 ) are used in URL redirection. You got redirected to another web page. 4xx series – Client errors! The site or page couldn’t be reached, the error seems to have been caused by the client side. The most common error in this series is 404 Page not found. 5xx series – Server errors! Failure. A valid request was made by the client side but the server failed to fulfil the request. This is a suitable status code that mirrors everyday, typical, proper performance of your website. Http status codes 200 is generally set examining whether standing of our web page is OKAY or not. Http Status code 301 is established when you need to permanently redirect a URL(webpage) to a new link. When the new URL of the website is created then http status code 301 redirect the site visitors landing on old URL to brand new URL. Generally 301 permanently redirection code is used when a blogger/website owner replaces an old webpage URL to new a new one. If you don’t want to lose your existing users than it is the best way to acquire new users with existing users. Http status codes 302 is similar to 301, as the site visitors touch down on a page that is redirected to new URL however, for short duration. This code 302 instruct internet search engine crawler to treat the redirect as short-term, suggests it does not pass along the web link equity as 301 code does. Http condition codes 403 generates when user need permission to access a webpage. When a person attempts to access some page or sources however it is forbidden. Some webpages are only for the authorized user, if a user tries to access a webpage that is restricted for general user then the server response 403 forbidden. For example, customer is not permitted to check out that web page for one reason or another. Http status code 404 generated when a browser makes a request to a web server however that web page is not discovered or present on the server. One can see how it looks by typing in an URL that does not exist. In SEO 404 error is not good for the website when it drives a good amount of traffic. The best solution for this type of error (404 - Not Found) is to create 301 redirection to the web page for the offered domain name or the most appropriate web page. Http standing codes soft 404 resembles 404, it creates when requesting LINK exists but the web page is not discovered. It generally shows a blank page. This error occurs when the server times out while waiting for the request. The client didn't produce a request within the time that the server was prepared to wait. Generally, it comes due to slow internet connection or heavy files on the server. Http status code 410 is long-term than 404 error code that indicates page has actually gone permanently. It reflects that page is no longer readily available from the web server as well as forwarding address has not been set up. Links on your website having 410 web page sends out site visitors to dead source. Http Status Code 5xx series indicates the error from the server side. Http status codes 500 might impact your website. It indicates web pages on your site are missing. It is a web server side problem. When the browser sends a request to a web server and online search engine not able to response the request. Http Status code 503 produces when the web server is not available for servicing the request. When browser requests to server, website server are under maintenance so it will not response the request. The search engine is unavailable for a brief period of time as well as will quickly return back. Nowadays, many website owners face 503 service unavailable error on their website. This problem is created when you update your website theme/plugin or make changes on your website. Vina is a passionate Blogger from New Delhi. She uses her own blog TheDigiMarket to provide quality content & tutorials to guide newbie bloggers to improve their blog & earn some extra stuff. Her blog mainly focuses on Blogging Tips, Digital Marketing, Social Media Marketing, Search Engine Optimization, Link building and much more.